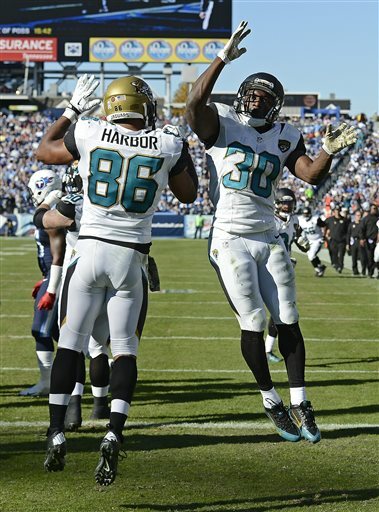 NASHVILLE, Tenn. — Maurice Jones-Drew and Jordan Todman each ran for a touchdown, and the Jacksonville Jaguars got their first win this season by beating the Tennessee Titans 29-27 Sunday. The Jaguars (1-8) scored the most points in a game this season for first-year coach Gus Bradley. They never trailed and forced four turnovers they turned into 17 points. The Titans scored twice in the final 4:15, the last on a 14-yard TD pass by Ryan Fitzpatrick to Delanie Walker with 40 seconds left. But Johnathan Cyprien recovered the onside kick to seal the victory. On a day the Titans (4-5) held a moment of silence for late owner Bud Adams, they got caught looking ahead to Thursday night's AFC South game with division leader Indianapolis. The Titans also lost Jake Locker to an injured right foot that had him on crutches and in a walking boot in the second half.